Residential heating oil prices have increased by 68 cents per gallon since the beginning of October. Prices for heating fuels typically increase during the winter. U.S. residential heating oil prices rose 7 out of the previous 10 years through this point of the heating season, by an average increase of 28 cents per gallon. Heating oil prices are determined by the balance of residential demand and supply as well as crude oil prices. Heating oil prices fell rapidly during the winter of 2008-2009 as a result of plummeting crude oil prices due to the recession. Unusually cold weather in the Northeast United States and Europe, the world's two largest heating oil markets, increased heating oil demand early in the season on both sides of the Atlantic. 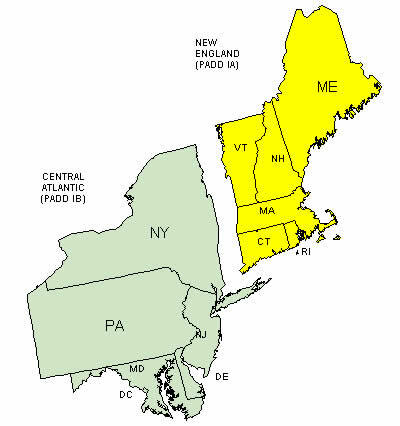 This has contributed to a draw in East Coast (PADD 1) distillate stocks, with New England high sulfur distillate stocks (also known as heating oil) now 4.8 million barrels lower than at the beginning of the heating season. However, East Coast distillate stocks in October were at the top of the average range for that time of year, and today stocks remain in the middle of the typical range. Most world and domestic crude oil prices have also increased by $18-19 dollars per barrel (about 43-45 cents per gallon) during this period, which in addition to the tighter distillate fuel supply-demand balance, has resulted in higher petroleum product prices.